Let me start of by saying that I made breaded pork chops for dinner but forgot to take a photo! Sigh. The perils of the food blog. They were lovely looking and delicious. I put them in an egg wash and then dredged them in a mixture of bread crumbs, plain and panko, rosemary, sage, thyme, salt and pepper. They were browned in saute pan in a little olive oil, just enough to give the breading a golden color. The pan went in the oven for I think 20 to 25 minutes. They were cooked perfectly. The side dishes both are from the new Bon Appetit. I, of course, altered them to fit our tastes, which means I did not use garlic. Loved both the Potato Cake and the Leeks en Cocotte. My versions of the recipes, which serve 2, are at the bottom of this post. The Apple Pie. I asked Chris if he would rather have an Apple Cake or Apple Pie. He voted for the pie. I used the Pate Brise recipe and the filling was from Mark Bittman's How to Cook Everything The Basics. Delicious, especially with ice cream. Preheat oven to 350°. Generously butter cake pan; set aside. Heat 2 Tbsp. butter to skillet. Once butter is melted, add potatoes; season with salt and pepper and cook, tossing occasionally, until beginning to soften, 6–8 minutes. Add 3 tablespoons unsalted butter and continue to cook potatoes, tossing occasionally, until tender and golden brown in spots, 15–20 minutes longer. Transfer potatoes to prepared cake pan, pressing down firmly and evenly (this will help potatoes hold together when you turn the potato cake out). Bake potatoes until crisp on top, 12–15 minutes. 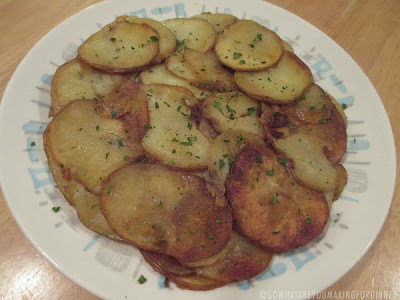 Let cool 5 minutes, then invert potato cake onto a plate, season with salt and pepper, and top with parsley. DO AHEAD: Potatoes can be sautéed and arranged in cake pan 6 hours ahead. Cover and chill; bake 10–15 minutes longer to warm through. Heat oil in a large skillet with a lid over medium-high heat. Add shallot and bacon and cook, stirring, until bacon is crisp, about 3 minutes. Add leeks, season with salt and pepper, and cook, occasionally turning leeks and stirring gently, until leeks are bright green, about 5 minutes. Add wine to skillet; bring to a boil, reduce heat, and simmer until slightly reduced, about 2 minutes. Add broth; bring to a boil, reduce heat, and simmer, partially covered, until leeks are just tender, 8–10 minutes longer. Mix in butter. 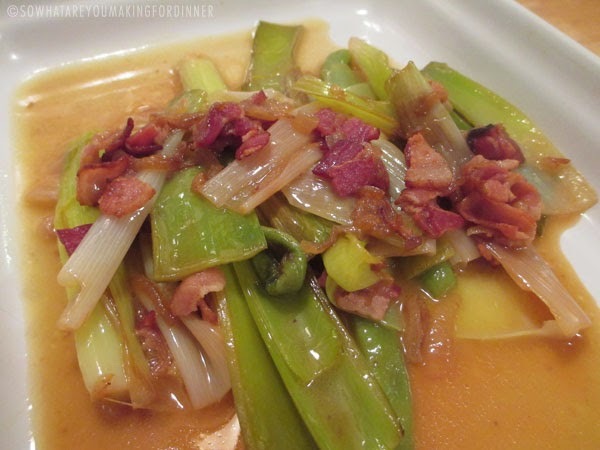 DO AHEAD: Leeks can be rinsed 1 day ahead. Wrap in a damp paper towel and chill. Sift the flour, salt and sugar together into a bowl; add butter and shortening and cut them into dry ingredients with a pastry blender or 2 knives until mixture is like coarse meal. Sprinkle on and blend in enough of the ice water to make a workable dough, mixing water in lightly with a fork. Turn dough out onto you work surface and, using the heel of your hand, smear the dough away from you, about 1/4 cup at a time. Scrape up the smeared dough into a ball, wrap, and refrigerate for at least 2 hours. Apple Pie, variation on Mark Bittman's recipe. Preheat oven to 425˚F. Divide pie dough in half. Roll out bottom crust. Fit into pie plate. Toss brown sugar, cinnamon, nutmeg and salt in large bowl. Peel, quarter and core apples and cut them into 1/2 to 3/4 thick slices. Toss the apples and lemon juice with the sugar-spice mixture. 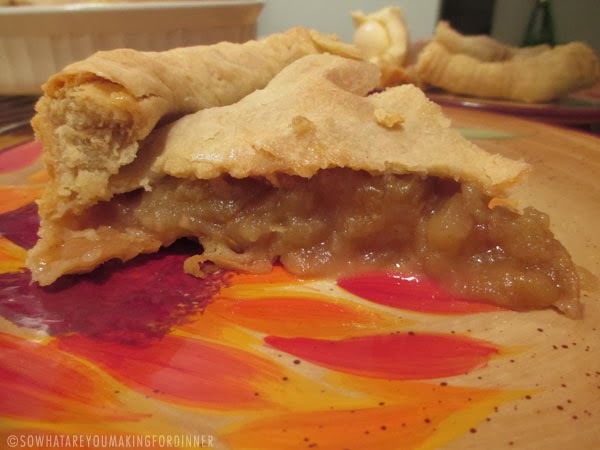 Put the apples into the bottom crust, making the center higher than the sides. Roll out the top crust. 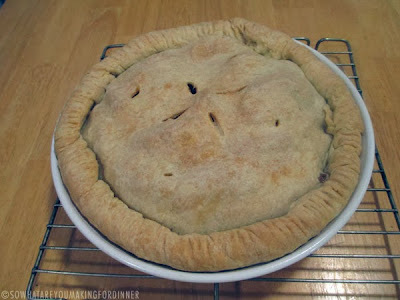 Dot the top of apples with butter and put the top crust on the pie. Trim and crimp the edges. Cut several 2 inch slits in the top crust. Bake for 20 minutes, then reduce heat to 350˚F and back for 40 to 50 minutes, until crust is gold brown and flaky. Cool on a rack.